A Shepherd's Heart: It's Not "Hammer Time": Being mindful of your words and actions. It's Not "Hammer Time": Being mindful of your words and actions. Read: Proverbs 10:11, Proverbs 12:18, Proverbs 15:4. Proverbs 16:24, Proverbs 18:21, 1 Corinthians 13. God has given us many tools and also wants to produce the fruit of The Spirit in and through us. Sometimes people forget that things like harshness, anger, etc are not part of the fruit of The Spirit. Furthermore, the scripture reminds us that Love is patient, love is kind...(See 1 Corinthians 13) but sometimes others in our lives or even ourselves lack these very things in relation to others. I'm also reminded of Proverbs 16:24 "Gracious words are like a honeycomb, sweetness to the soul and health to the body." As always, our words can bring life or death to the hearer. Our words are more powerful than we realize because those words whether good or bad, stay with the hearer and sometimes much longer than they should when we speak unkind words. This is why I've shared in the past that the old saying, "Sticks and stones may break my bones but words may never hurt me," while a nice sentiment, it's not really true because words do hurt and it takes more time mentally and emotionally to heal from words spoken to us. While there are times where we need to be more firm in our communication, we need to remember that even in being firm with others who have wronged us, or who need correction, or that we disagree with, we need to season that with grace so we can represent The Lord more effectively. Unfortunately it seems as though some only bring the "hammer" which is a harshness to ever situation. Their words are like a hammer that harshly comes down on the hearer like a nail being hammered down. And contrary to what some may thing, it's not always, "hammer time" my friend! I know as a husband, dad, as well as co-worker and friend, that with deep regret, I've failed many times by bringing the wrong tool to the situation when correction was needed with my children or disagreement arose with my spouse or a friend or co-worker. I have been impatient and harsh at times and I apologized later after I realized I could have handled things much for grace filled than I did. I've witnessed the very same things in others in ministry or the business world who only "swung a hammer" when the hammer was the wrong tool! The fact is that If you only bring a proverbial hammer to every situation...you will only experience and cause turmoil, strife, resentment and more! 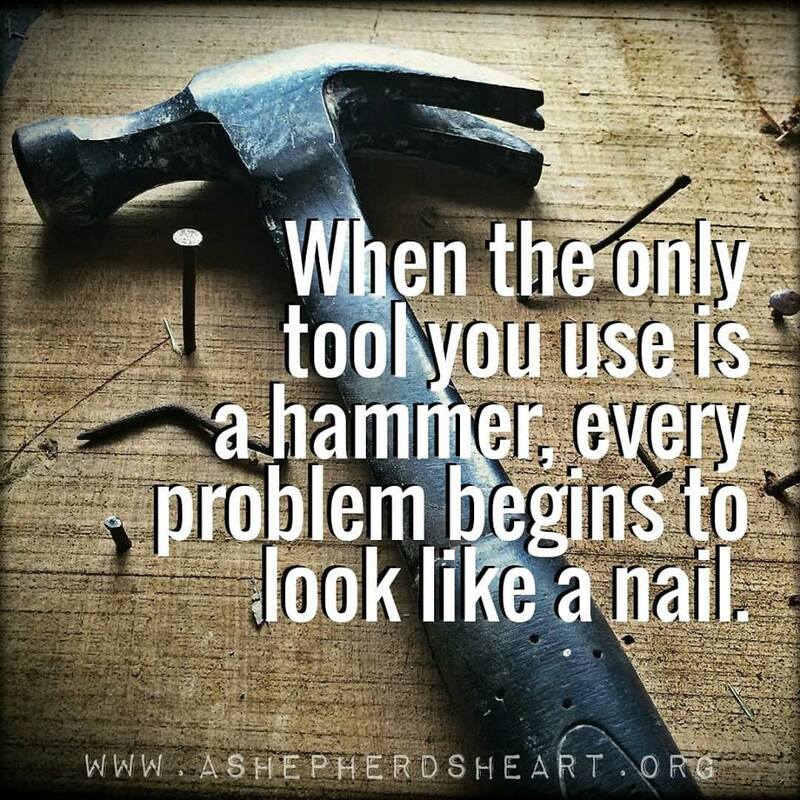 No matter what you might think, not everyone is a nail that calls for us to hammer them. A lot has to do with our perspective, attitudes, and actions when it comes to each situation as well as our reliance on The Holy Spirit to give us wisdom on how to communicate better..especially in this supposed "connected" age where words fly left and right from social media or internet pundits. If we're in Christ then we need to bring the right tools with us and that's not always the "hammer", rather...it also and most often requires using the tools of grace, love, peace and truth as much as possible. "hammer time" through the wise use of our words and actions. No dancing required unless of course...you want to bust a move or is it busting up the wrong move? :-) As for me, you really don't want me to dance...really, because I can't! :-) But, I digress. May we lay the wrong tool or tools down and pick up and use the right tools my friend and may God give us the wisdom to know how to pick and use the right tools for each situation and person we face. P.S. Next month, I'm planning on focusing all the www.ashepherdsheart.org posts on The Bible specifically: Bible Study, Devotions, Memorization as God's Word is essential to Living Life On Purpose in Christ. Stay tuned and prayers appreciated as I prayerfully prepare each communication for you. Thanks!